For the similarly named World War II-era aircraft, see North American T-6 Texan. The Beechcraft T-6 Texan II is a single-engine turboprop aircraft built by the Raytheon Aircraft Company (which became Hawker Beechcraft and later Beechcraft Defense Company, and was bought by Textron Aviation in 2014). A trainer aircraft based on the Pilatus PC-9, the T-6 has replaced the Air Force's Cessna T-37B Tweet and the Navy's T-34C Turbo Mentor. The T-6A is used by the United States Air Force for basic pilot training and Combat Systems Officer (CSO) training, the United States Navy and United States Marine Corps for primary and intermediate Naval Flight Officer (NFO) training, and by the Royal Canadian Air Force (CT-156 Harvard II designation), Greek Air Force, Israeli Air Force (with the "Efroni" nickname), and Iraqi Air Force for basic flight training. The T-6B is the primary trainer for U.S. student naval aviators (SNAs). The T-6C is used for training by the Mexican Air Force, Royal Air Force, Royal Moroccan Air Force, and the Royal New Zealand Air Force. The Model 3000/T-6 is a low-wing cantilever monoplane with enclosed tandem seating for two. It is powered by single Pratt & Whitney Canada PT6A-68 turboprop engine in tractor configuration with a four-bladed, constant-speed propeller and has a retractable tricycle landing gear. The aircraft is fitted with Martin-Baker Mark 16 ejection seats and a canopy fracturing system. The T-6 is a development of the Pilatus PC-9, modified significantly by Beechcraft to enter the Joint Primary Aircraft Training System (JPATS) competition in the 1990s. A similar arrangement between Pilatus and British Aerospace had also been in place for a Royal Air Force competition in the 1980s, although that competition selected the Short Tucano. The aircraft was designated under the 1962 United States Tri-Service aircraft designation system and named for the decades-earlier T-6 Texan. The JPATS competition-winning design was based on a commercial off-the-shelf Pilatus PC-9, with minor modifications. Additional requirements and conflicts between the Air Force and the Navy resulted in delays, cost increases (from initial estimates of $3.9 to roughly $6 million per aircraft), and a completely new aircraft that is 22% or 1,100 lbs heavier than the Pilatus. On 9 April 2007, the U.S. Department of Defense released their Selected Acquisition Reports, which reported that the T-6 JPATS program was one of only eight programs cited for Congressional notification for 25–50% cost overrun over initial estimates, which is referred to as a "Nunn-McCurdy Breach" after the Nunn-McCurdy Amendment. It is unusual for a program so far into full-rate production to experience significant enough cost overruns to trigger this congressional notification. In October 2017, the Argentine Air Force received the first four of 12 T-6C+ purchased from Textron Aviation  and another two in June 2018. The CT-156 Harvard II is a variant used for pilot instruction in the NATO Flying Training in Canada (NFTC), located at 15 Wing, Moose Jaw, Saskatchewan. They are leased to the Royal Canadian Air Force by the program's administrator, CAE. NFTC's Harvard II aircraft are almost identical in cockpit layout and performance to the American JPATS Texan IIs. Within NFTC, students fly the Harvard II in Phase 2 and 3 of the training program, and some will go on to fly the CT-155 Hawk jet trainer also used by NFTC for Phase 4 (Moose Jaw) and Phase 5 Fighter Lead-In Training (4 Wing, Cold Lake, Alberta). NFTC had 25 Harvard II aircraft owned and maintained by Bombardier, although one was lost following a non-fatal crash in 2011. CAE took over the program in 2015. The Hellenic Air Force operates 25 T-6A and 20 T-6A NTA aircraft. On 9 June 2008, the Defense Security Cooperation Agency announced a possible FMS sale to Israel of 25 T-6As for the Israeli Air Force. In July 2009, Beechcraft delivered the first four of 20 T-6As under contract to the Israeli Air Force. On 16 December 2009, the first four of 15 T-6A aircraft are delivered to Iraq under a $210 million contract. No AT-6 aircraft were included as was previously reported. This equates to an average of $14 million per aircraft with support and training included. The first eight aircraft, purchased by the Government of Iraq, will arrive at Tikrit by the end of January 2010. The last seven, purchased by the United States, are expected by the end of December 2010. On 13 May 2014, the US State Department approved an order for 24 T-6C aircraft for use as trainers by the Iraqi Air Force. The sale was worth US$790 million and was part of a larger one billion dollar deal. On 9 January 2012, Mexico purchased six T-6C+ aircraft for the Mexican Air Force to begin replacing their Pilatus PC-7 trainers. On 24 October 2013, Hawker Beechcraft announced a follow-on order of an additional six T-6C+ aircraft for the Mexican Air Force, bringing the total ordered to 12. The Mexican Navy also ordered two T-6C+ Trainers in March 2014. In October 2009, Hawker Beechcraft announced the sale of 24 T-6Cs for the Royal Moroccan Air Force. The New Zealand Government announced the purchase of 11 T-6Cs for the Royal New Zealand Air Force for NZ$154 million, on 27 January 2014 to replace the PAC CT/4 Airtrainer, with all aircraft delivered by February 2015. The first training course using the type began early 2016. The T-6Cs are expected to remain in service with the RNZAF for 30 years. On 24 October 2014, the UK Ministry of Defence announced its preferred bidder for the UK Military Flying Training System programme. Ascent's system will involve T-6C Texan IIs in the basic trainer role for both Royal Air Force and Royal Navy pilots. The contract for ten aircraft was signed by Affinity Flying Training Services and Beechcraft Defense on 4 February 2016. The T-6C trainers will replace Shorts Tucano T1 aircraft. 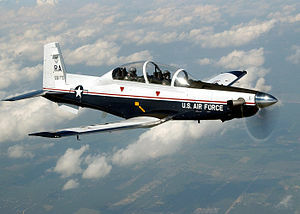 The T-6A was introduced to Moody Air Force Base and Randolph Air Force Base in 2000–2001, and the Air Force awarded the full-rate T-6 production contract in December 2001. Laughlin Air Force Base began flying the T-6 in 2003 where it is now the primary basic trainer, replacing the T-37. Vance Air Force Base completed transitioning from the T-37 to the T-6 in 2006. That year, Columbus Air Force Base began its transition, and retired its last T-37 in April 2008. The last active USAF T-37Bs were retired at Sheppard Air Force Base in the summer of 2009. The Texan failed to qualify for the Light Attack/Armed Reconnaissance program, because the USAF mailed the exclusion notice to the wrong address, leaving the company with no time to protest the decision. But the official mail failure gave Hawker-Beechcraft a further legal justification, as they had told the USAF they planned to file a legal challenge even before the official notice had been mailed and brought its considerable political influence to bear against the USAF decision against their candidate with one Kansas Congressman stating, "It is simply wrong for the Obama administration to hire a Brazilian company to handle national security when we have a qualified and competent American company that can do the job." In 2013, Beechcraft was once again the loser. In August 2017, the Air Force conducted the "Light Attack Experiment" to evaluate potential light attack aircraft. Following this, it decided to continue experimenting with two non-developmental aircraft, the Textron Aviation AT-6 Wolverine derivative of the T-6 Texan II and the Sierra Nevada/Embraer A-29 Super Tucano. Tests were scheduled to be conducted at Davis-Monthan Air Force Base, Arizona between May and July 2018. The tests are intended "to experiment with maintenance, data networking and sensors . . . [to] gather the data needed for a rapid procurement", according to Secretary of the Air Force Heather Wilson. Experimentation will examine logistics requirements, weapons and sensor issues, and future interoperability with partner forces. The Air Force expects to have the information it needs to potentially buy light attack aircraft in a future competition, without conducting a combat demonstration, based on data collected during the first round of the experiment and future data anticipated to be collected in the next phase of experimentation. During the last week of January 2018 a cluster of unexplained physiological events involving the T-6 occurred at Columbus, Vance, and Sheppard Air Force Bases. In response, the commander of Nineteenth Air Force, which is responsible for USAF pilot training, directed an "operational pause" in Texan II operations on February 1, 2018 to ensure aircrew safety. The pause was intended to enable the Air Force to "examine the root causes of the incidents, educate and listen to aircrew, develop and deliver mitigation solutions." The Air Force had established a general officer-led team to integrate and coordinate efforts across the Air Force to address aircrew unexplained physiological events earlier in 2018. In February 2018 the AT-6 Wolverine and the Embraer A-29 Super Tucano were named as the only two remaining aircraft in USAF's light attack aircraft competition. Air Force Secretary Heather Wilson described the AT-6 and A-29 as "most promising". Two RCAF CT-156 Harvard II at the Alliance Air Show in 2014. Standard version for the USAF, USN, and Hellenic Air Force (25). Armed version of the T-6A for the HAF (20). T-6A NTA has the capability to carry rocket pods, gun pods, external fuel tanks, and bombs. Upgraded version of the T-6A with a digital glass cockpit that includes a Head-Up Display (HUD), six multi-function displays (MFD) and Hands on Throttle And Stick (HOTAS), used at Naval Air Station Whiting Field, Naval Air Station Corpus Christi, and United States Naval Test Pilot School. Armed version of the T-6B for primary weapons training or light attack roles. It has the same digital cockpit, but upgraded to include datalink and integrated electro-optical sensors along with several weapons configurations. Engine power is increased to 1,600 shp (1193 kW) with the Pratt & Whitney Canada PT6-68D engine, and the structure is reinforced. Upgraded version of the T-6B with wing hard points, primarily designated for export sales. Version based on T-6B and C for the US Army for operational support, testing, utility, and chase plane roles. Version of the T-6A for NTFC with the Canadian Forces. Nearly identical to standard USAF and USN in terms of avionics, cockpit layout, and performance. Argentine Air Force – 12 T-6C+ on order, six delivered as of June 2018. Mexican Air Force 6 T-6C+ delivered in 2012. A follow-on order for 6 more planes was made, due for delivery in late 2013. Royal Moroccan Air Force 24 T-6Cs in service as of January 2012. No. 14 Squadron RNZAF – 11 T-6Cs for the pilot training role at RNZAF Base Ohakea. ^ "T-6A Texan". U.S. Air Force. United States Air Force. ^ "Llegaron los aviones Texan que el Gobierno le compró a EE.UU". Clarín (in Spanish). 2 October 2017. Retrieved 22 May 2018. ^ a b "Argentina receives further Texan IIs, assigns Tucanos to border patrol mission. - Jane's 360". www.janes.com. Retrieved 30 June 2018. ^ Bombardier Military Aerospace Training (November 2011). "NFTC The Concept". Archived from the original on 25 April 2012. Retrieved 1 November 2011. ^ a b c Department of National Defence Public Affairs (March 2007). "CT-156 Harvard II". Retrieved 5 July 2016. ^ Department of National Defence Public Affairs (March 2007). "CT-156 Harvard II Specs". Archived from the original on 6 December 2010. Retrieved 4 November 2011. ^ "CAE takes over the NATO Flying Training in Canada program – Bombardier deal closed". Ottawa Citizen. 1 October 2015. Retrieved 23 December 2016. ^ Amynanet. ">ΑΜΥΝΑ & ΔΙΠΛΩΜΑΤΙΑ 18. Εκπαιδευτικά αεροσκάφη". Archived from the original on 29 August 2009. Retrieved 24 October 2009. 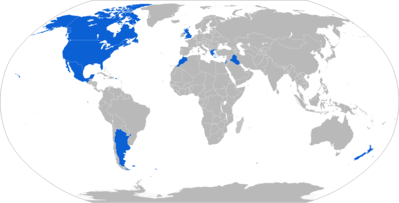 ^ "Israel Requests Delivery of 25 U.S. T-6A Texan II Trainers". Defense-update.com. Retrieved 25 October 2013. ^ Egozi, Arie. "Israel receives first four T-6A 'Efroni' trainers". Flight International, 13 July 2009. ^ "The Penny Drops: Iraq Chooses its Training & COIN Aircraft". Defense Industry Daily. 15 May 2014. Retrieved 12 May 2015. ^ "US OKs Nearly $1 Billion Deal With Iraq". www.defensenews.com. 13 May 2014. Retrieved 14 May 2014. ^ "News & Press". Beechcraft Newsroom. Archived from the original on 19 November 2015. Retrieved 12 May 2015. ^ a b "Mexico's T-6C+ Turboprop Planes: SIVA's 1st Counterpart". Defenseindustrydaily.com. Retrieved 25 October 2013. ^ "Mexican Navy Places Initial Order for Beechcraft T-6C+ Trainers". Textron Aviation. 24 March 2014. Archived from the original on 30 March 2014. Retrieved 28 March 2014. ^ a b "Hawker Beechcraft sells 24 trainers to Morocco". kansas.com. Retrieved 29 September 2017. ^ "New Zealand signs T-6C trainer deal". Flight International. 27 January 2014. Retrieved 28 January 2014. ^ a b Coleman, Jonathan (27 January 2014). "New pilot training capability contract awarded". Media release. New Zealand Government. Retrieved 27 January 2014. ^ "Beechcraft supplying trainer planes for British program". UPI. 4 February 2016. ^ USAF. "80th Flying Training Wing". Archived from the original on 10 January 2010. Retrieved 24 October 2009. ^ Trimble, Stephen. "Mail mix-up makes Hawker Beechcraft miss protest deadline for USAF contract; appeal filed in federal court." Flight Global, 27 December 2011. ^ Tamir Eshel. "USAF Determined on Super-Tucano for Afghanistan Even at Higher Cost". defense-update.com. Retrieved 12 May 2015. ^ No byline (2 February 2018). "Air Force announces next steps in light attack experimentation". Secretary of the Air Force Public Affairs. Retrieved 2 February 2018. ^ No byline (1 February 2018). "19th Air Force commander directs T-6 operational pause". Air Education and Training Command Public Affairs. Retrieved 2 February 2018. ^ Niles, Russ (3 February 2018). "Air Force Narrows Light Attack Field". AVweb. Retrieved 5 February 2018. ^ a b Bertorelli, Paul. "NBAA 2009 Video Series: Hawker Beechcraft's Turboprop Attack Aircraft". AvWeb. Retrieved 3 July 2016. ^ Hawker Beechcraft Corporation. "Beechcraft AT-6". Archived from the original on 1 October 2008. Retrieved 4 October 2008. ^ "AT-6B Light Attack Aircraft / Trainer". airforce-technology.com. Retrieved 5 July 2016. ^ Beechcraft displays at Paris Air Show 2015 Beechcraft 30 May 2015. ^ "GTRI helps transform a T-6 trainer into a light attack aircraft." Georgia Institute of Technology, 15 June 2012. ^ "Beechcraft delivers four T-6 military training aircraft to United States Army" Textron Aviation, 15 June 2015. ^ "2 Canadian Forces Flying Training School". forces.gc.ca. Archived from the original on 19 April 2015. Retrieved 12 May 2015. ^ "The Penny Drops: Iraq Chooses its COIN Aircraft". Defense Industry Daily. 12 August 2009. Retrieved 14 August 2009. ^ Reed Business Information Limited. "AirSpace". flightglobal.com. Retrieved 12 May 2015. ^ "Mexico compra en EU aviones militares para practicas". Notimex (in Spanish). 9 January 2012. Retrieved 10 January 2012. ^ "Mexico's T-6C+ Turboprop Planes: SIVA's 1st Counterpart". defenseindustrydaily.com. 24 October 2013. Retrieved 29 October 2013. ^ "Mexican Navy Places Initial Order for Beechcraft T-6C+ Trainers". 3 April 2014. ^ Reed Business Information Limited. "New Zealand signs T-6C trainer deal". flightglobal.com. Retrieved 12 May 2015. ^ John Pike. "T-6A Harvard II Joint Primary Air Training System (JPATS)". globalsecurity.org. Retrieved 12 May 2015. Wikimedia Commons has media related to Beechcraft T-6 Texan II. This page was last edited on 6 April 2019, at 15:38 (UTC).